The plan was to dive on the wreck of the Chandris. Alan Lopez, skipper of the M/V Spellbinder, on the previous weekend had dropped a group onto a bit of wreckage where all manner of interesting objects had apparently been seen. His aim was to drop us off on the same area of wreckage. The shot was duly dropped with a fair old current evidently dropping. As the divers peeled off into the water, the shot suddenly drifted free in the current, with Alan hastily shouting instructions to the submerging divers to try and follow the drag line across the bottom. 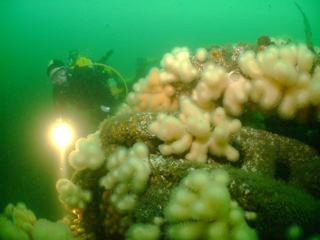 Once on the seabed we quickly came across wreckage but from which wreck as debris from the Chandris and Oslofjord lay intermingled across each other in places. Drifting on Maurice and Richard soon came across the bows of the Oslofjord. 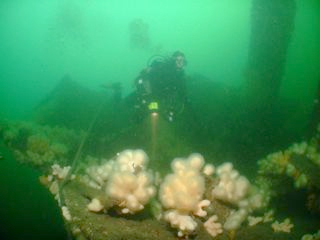 This area of wreckage rises several metres off the seabed. 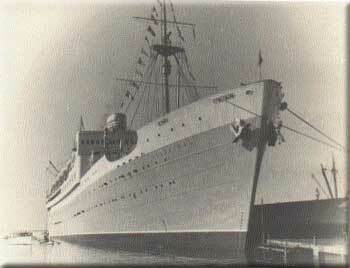 The bow itself is reasonably intact although lying on its port side. 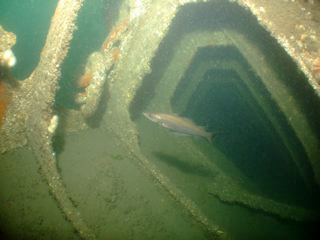 It is possible to swim inside parts of this wreckage although some caution is advised as the structure is clearly deteriorating as a result of the corrosion of nearly 60 years of seawater and winter storms. 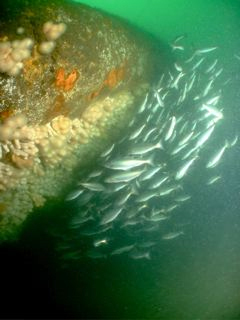 Drifting around and under the bow itself we encountered a large shoal of fish sheltering from the current. Indeed this dive was notable for the number of fish observed patrolling around the wreckage including several large Pollack. 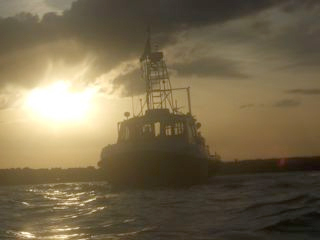 After 50 minutes with no other divers on this area of wreckage we headed carefully back to the surface and the waiting Spellbinder silhouetted against the setting sun, a reminder that the nights are drawing in and that autumn will soon be upon us.